In this article, we will discuss the very first question which might strike in your head that “How to Start Online Store in India”. We will try to answer every step in the most simplistic way as much as possible. eCommerce is developing rapidly in India and its the most appropriate time to start an online store and take your business online. Market Opportunity: Why it’s important to start an online store? The online B2C eCommerce domain has the major stack in the Indian eCommerce industry and can be segmented on the basis of online travel and non-travel market. The non-travel market has been further segmented on the basis of online retail, online financial services, online mobile downloads and other online preferred services. In this article, we will discuss online retail only because the majority of the stack is related to retail only. Online retailing or e-tailing accounts for about 5.1% share of the INR ~ crore industry leading the forefront of the rapid growth. In the online retail market, personal items such as jewelry, apparel, and fashion accessories have the highest contribution. There are close to 400 non-travel independent online retailers that are active in the Indian e-commerce industry. The total number of online buyers is expected to cross 100 million by the end of 2017. 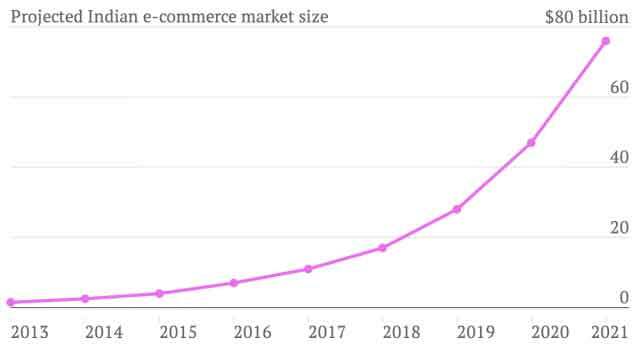 Also, the online retail market is likely to jump 65% in the year 2018. As per recent studies, the eCommerce industry will witness significant growth in the year 2017 mainly in the Indian e-commerce retail sector with rapidly increased internet penetration and mobile data affordability. This industry will continue to drive more business opportunities and contribute towards creating more employment and entrepreneurs. Building your online store will help you attract more clients and brake geographical boundaries. Your product and services will reach to more number of prospect clients, who might try out your services or products, how ? because it will be convenient for them to check out all your products or services and order online. Using an eCommerce Website builder / SAAS (Software as a service provider): There are many SAAS based eCommerce solutions are available in the market, which allows you to build eCommerce website using their pre-built themes/templates. This method is the easiest, however, this is not a long-term solution as your business grows. Such, solutions have very limited set of features and customization possibilities and you need to pay heavily as the monthly fee. Few of the SAAS providers offer mobile apps as a paid addon. Open Source Carts: You can also build eCommerce website using an open source software but this method is best suited for peoples having extensive knowledge of respective coding languages or frameworks. Such open source solutions offer basic set of features as standard and you need to buy separate plugins or build your own plugins to implement what you are looking for. With open source cart software, you do not get anything related to the mobile app you need to hire app developers to get your app developed which will add significant cost in development. Hire eCommerce Development Company: A specialized eCommerce development company can build what exactly you are looking for or what your business need in specific. If you are looking for a professional online store development, then you should hire a reputed eCommerce web development Company in India. A specialized company can build a competitive storefront which will blend with your business. Hiring eCommerce website development company will save your precious time and efforts, which you can utilize for your core business operations. Such, companies offer end-to-end design, development, testing, maintenance and support services which makes your business effortless. We at ClueCommerce offers end-to-end eCommerce solution including design, development, testing & maintenance of your eCommerce website as well as mobile apps. If, you choose method “one” you also need to buy a domain name from an authorized domain resellers such as Godaddy etc. Similarly, if you choose method “two” you need to buy domain name & web hosting and take care of your application/software related issues. However, if you choose to go ahead with method “three” you need not do anything, the development company will take care of everything from domain to hosting and support and so on. Now, your website is ready. Your customers can visit the website and place orders and inquiries. However, in order to accept online payments using credit/debit card, net banking, wallet etc against orders received on your online store, you’ll need a payment gateway to accept payments from your customers. Until few year’s back, getting a payment gateway account was difficult for anyone. It used to involve a lot of documentation, verification, huge setup fees, and technology integration in order to make it work. But now, it has become very easy to setup a payment gateway to accept seamless online payments. Based on the product or business requirements, you can signup with any payment gateways from severals gateway providers in India such as PayuBiz, Instamojo, EBS, CCAvenue etc. Now, you already know how to start an online store and it’s good to go. You have your site and app ready with payment gateway integrated. Now, it’s time for the real test of your patience as getting real sales is the hardest task, if you can succeed in this no one can stop you to become what you wanted to. It’s going to take constant work and promotion if you want regular orders, and part of that is going to be a willingness to try new methods of marketing. There are several methods to market your online store such as PPC, Social media marketing, Email marketing, SMS marketing, Blogging/Content Marketing, Influencer marketing, Video Marketing, Offline marketing, Mouth to Mouth Publicity and so on. Marketing your online store is a wide subject and it will not be justice to discuss the same in few paragraphs. Hence, we will try to cover every aspect in detail in upcoming post. We, hope this post will help you understand “how to start online store in India”. If you have any suggestion, recommendations or requirements, please do leave a comment below and we will try to respond as soon as possible.